This review is of AOMEI Backupper v4.6.3. Please let me know if there's a newer version I need to review. Full backup, incremental backup, and differential backup are supported in AOMEI Backupper. AOMEI Backupper is able to backup individual partitions, specific files, and folders, or an entire hard drive. Even the partition that Windows is installed to can be backed up with AOMEI Backupper. This works by using the Volume Shadow Copy Service (VSS), which allows a backup to run without having to shut down the computer or close open files. 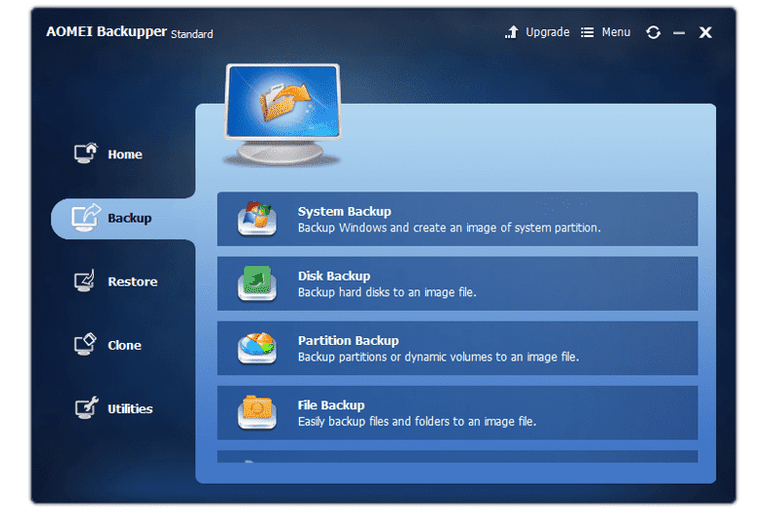 A backup is created as an AFI file and can be saved to a local drive, network folder, or external drive. If you're performing a partition or disk clone instead of a regular backup, the only destinations available, of course, are another partition or hard drive. AOMEI Backupper should definitely be a contender when choosing a good backup program. The interface is easy to work with for anyone and it's packed full of great features. Although AOMEI Backupper is pretty advanced, I like how simple it is to use. I didn't run across any settings or features that left me wondering what it did or how to use it. I also like that you can set up the system partition to be backed up on a schedule. Couple this with the Volume Shadow Copy support and you can keep your Windows partition backed up without any issues. When restoring files from a backup, the window you're browsing in can't be resized, which makes for a rather small area to use for selecting what to restore. Also, the original folder structure remains intact when restoring to a custom folder. There aren't any settings or options available to change this, which is a bit unfortunate. I also don't like that AOMEI Backupper is unable to pause a backup. You're able to cancel a backup in progress but having the option to simply pause it would be nice. More advanced features like merging incremental backups and using batch scripts to run a backup, are available in the commercial version of AOMEI Backupper.